Hiking is one of my favorite things to do. I’m not very athletic but I would get up early and hike up the highest mountain for the best views. 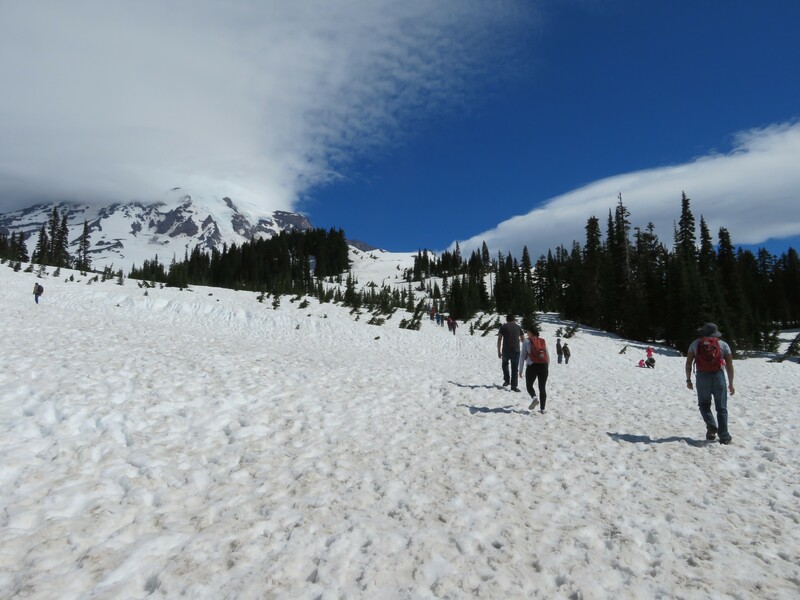 Come to think of it, I don’t think I’ve ever hiked a mountain ever until my Seattle trip when I hiked up Mount Rainier. 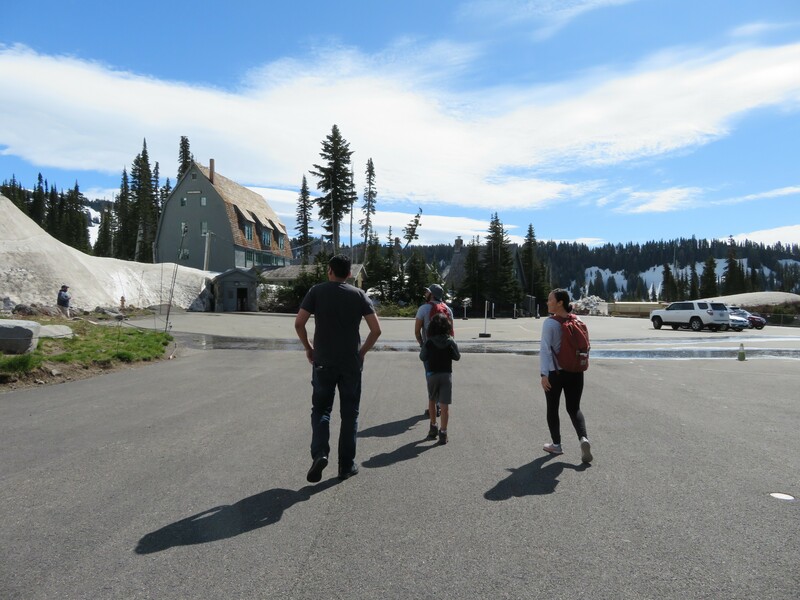 My crew and I left the house around 7:30am to begin our 2.5 hour expedition to Mount Rainier from Seattle. Lunch (AVOID): Mount Rainier Railroad Dining Co.
Our first stop was Q Bakery, a Vietnamese Bakery shop. We each ordered Banh Mi sandwiches, and Banh Bao (steamed pork buns) for the road and for our hike. Everything was cheap and tasty. Worth every penny and it hit the spot! 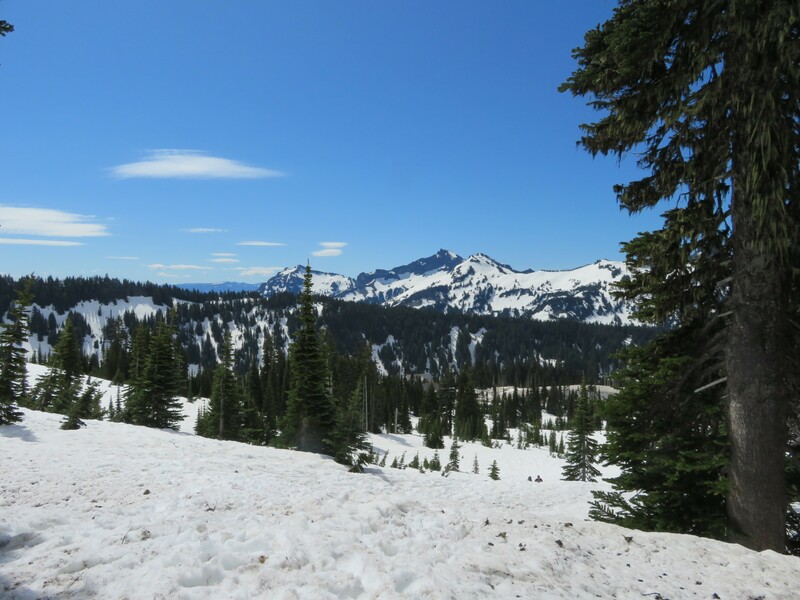 The drive to Mount Rainier wasn’t difficult this time of year. The sky was clear and there wasn’t too much traffic in the early morning. Once you go up the mountains, it turns into a single lane road. We did get stuck behind a few slow drivers who refused to pull over to the right. When it is safe to do so, you can pass them over on the left side. 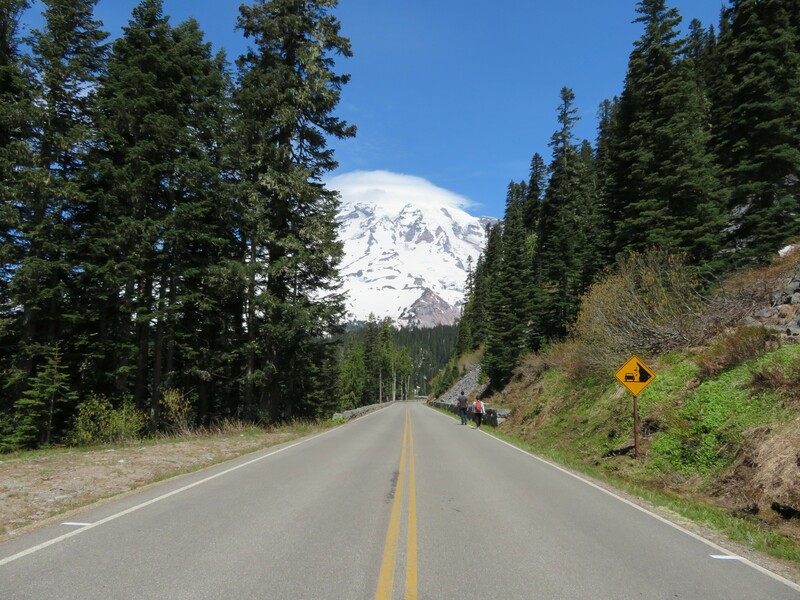 Once you approach Mount Rainier, you will need to pay $25/vehicle to enter into the mountain. The pass is valid for 7 days! I recommend asking the ranger for the best routes. 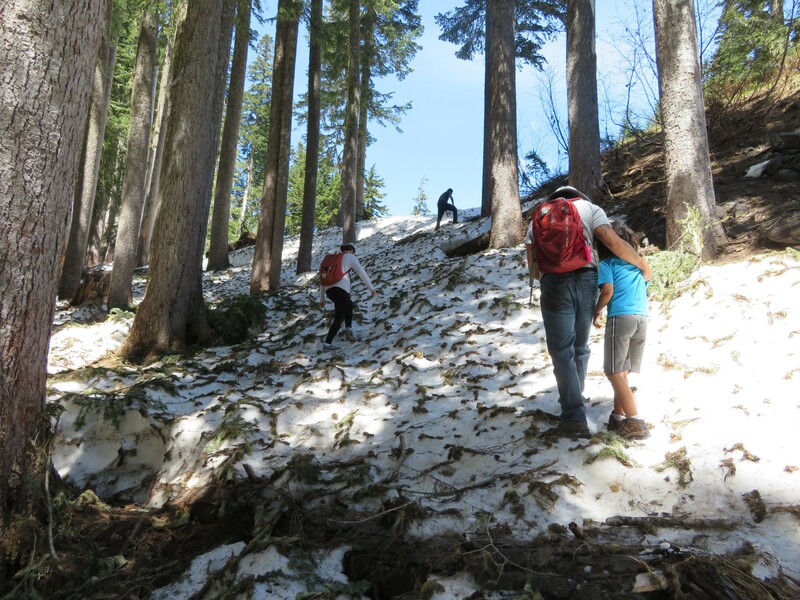 We selected a few hiking trails that were covered in snow even in June! Our first hike was Paradise. My brother heard great things about paradise but has never done the hike. The trail is usually covered with wildflowers during the summer and basically looks like paradise. We passed many trails on the drive to the top. Paradise had clear marked signs. Once we reached the top, there was a parking lot and an information office. The lot was pretty full by the time we got to Paradise around 10am. The information office had a bathroom facility located outside which is clean. The paradise hike didn’t have a clear trail. There was a lot of snow covering the tracks. It was a mission to go up the first hump. We hiked maybe 15 minutes before we realize that we won’t be able to make it and we wouldn’t get the view that we were hoping for. We decided to head back to the car and hit up the previous trail to the Reflection Lake. 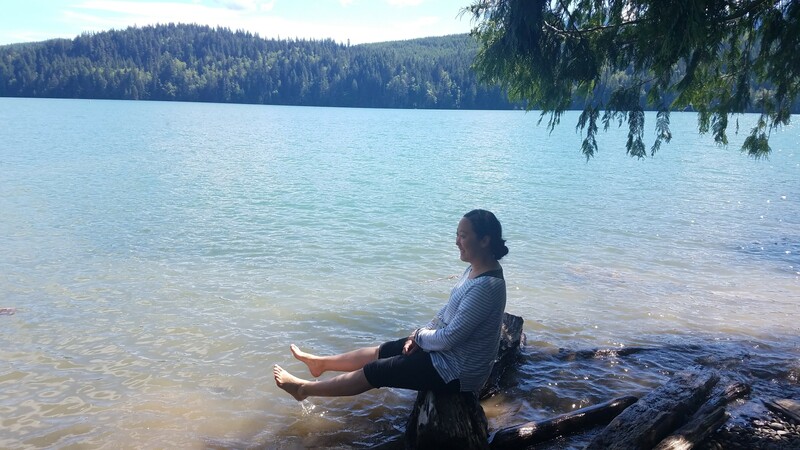 My brother kept raving about how secluded this lake was. 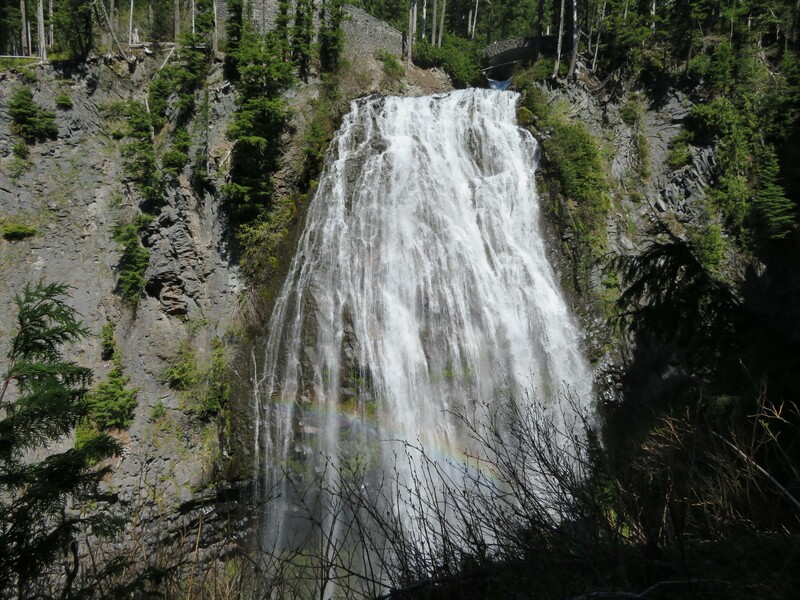 We enter though Narada Falls. We entered into the parking lot and we were greeted by a beautiful cascade. Most people who visit are there just to snap photos and head on to the next photo op spot. 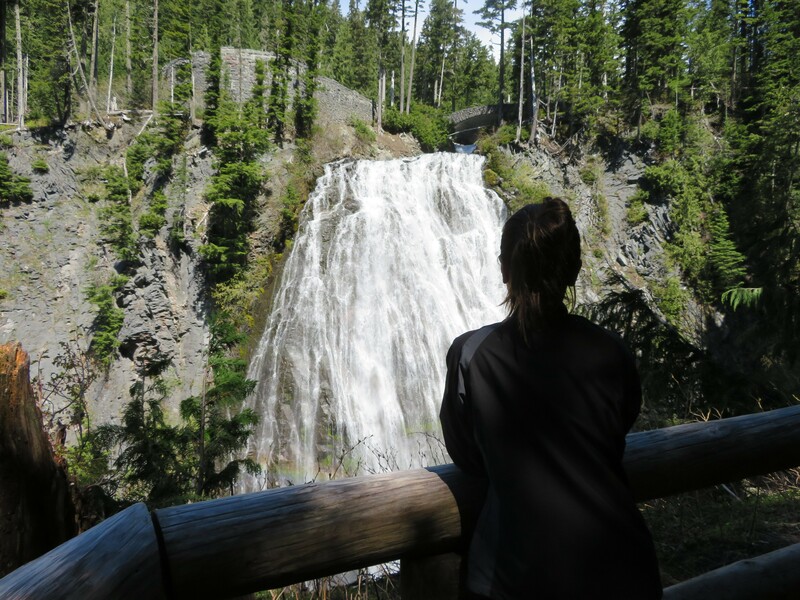 From Narada Falls, there are 2 trails that you can take, one leading to the reflection pool. The hike was more of my scale of hike. It was a nice stroll with a few inclines. There were a few snow patch in our pathway. We kept walking and walking and the snow patches just got heavier. Next thing you know, our trail was sealed off and we hiked blindly. We tried to follow foot prints but they lead us to deadends. Needless to say, we didn’t find the reflection pool. We found our way back to our vehicle by following the traffic sounds. Unsuccessful hiking trip but we got a work out. 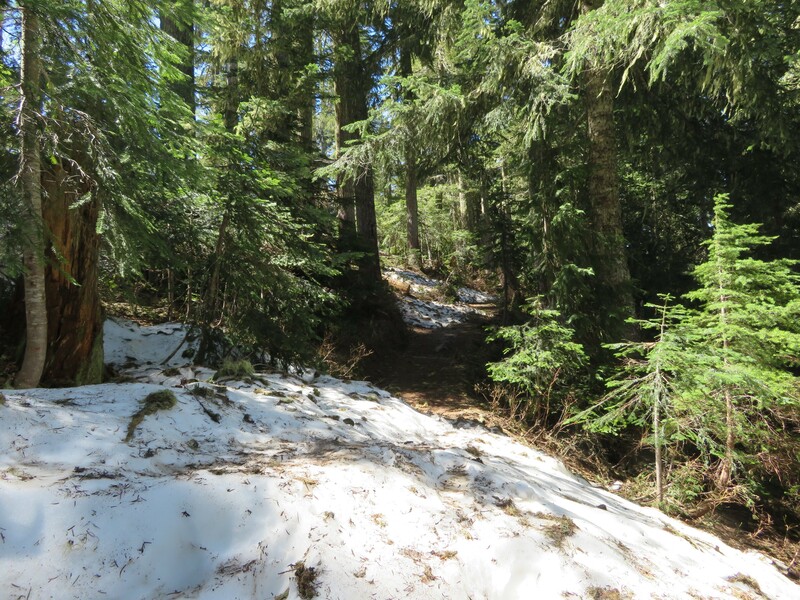 I don’t advise hiking on your own and once again, ask a ranger / info assistant for best hikes that time of year. 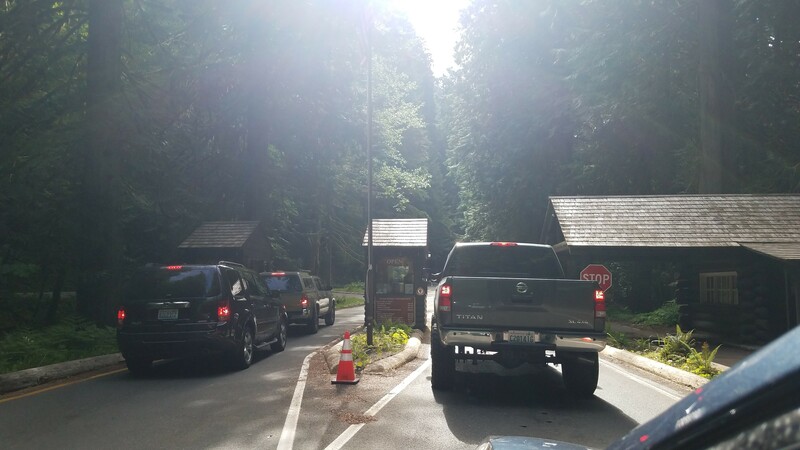 We left the park around 1pm and the line to enter into the park had stretch for about a mile. I’m glad that we got there early enough to avoid the traffic and the parking situation. On our way to find lunch, we came across signs of people selling Rainier cherries on the streets. We immediately hopped at the opportunity. 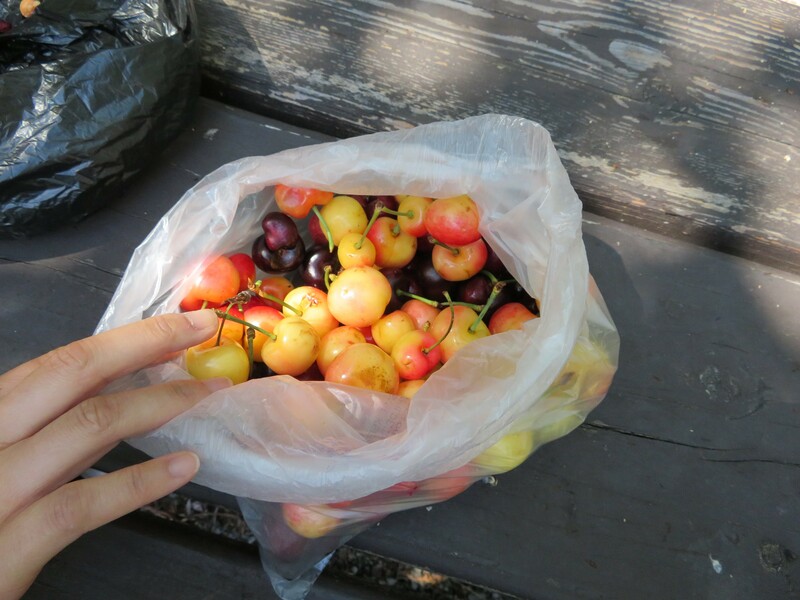 We purchased a 3lbs bag of regular cherries and rainier cherries for $10. We can’t wait to eat them! 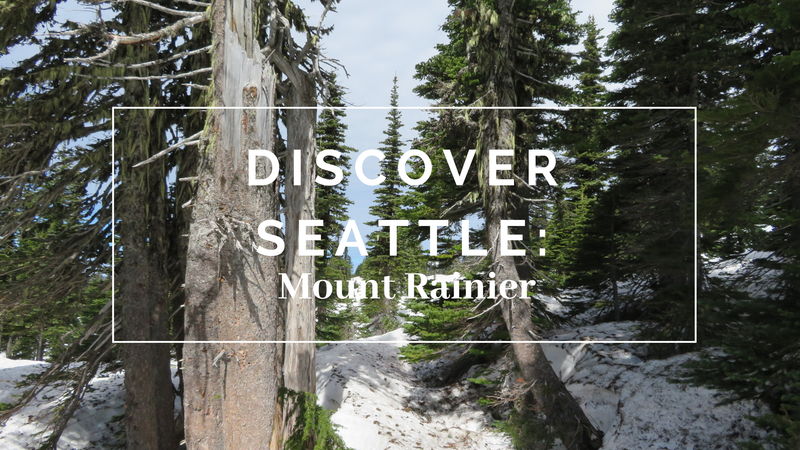 There isn’t a lot of places to eat near Mount Rainier. We drove by an awesome Train museum and decided to have lunch at their diner. Mount Rainier Railroad Dining Co. had terrible food. None of us enjoyed the food. Our food was overcooked, burnt, and had no flavor. Avoid at all cost. 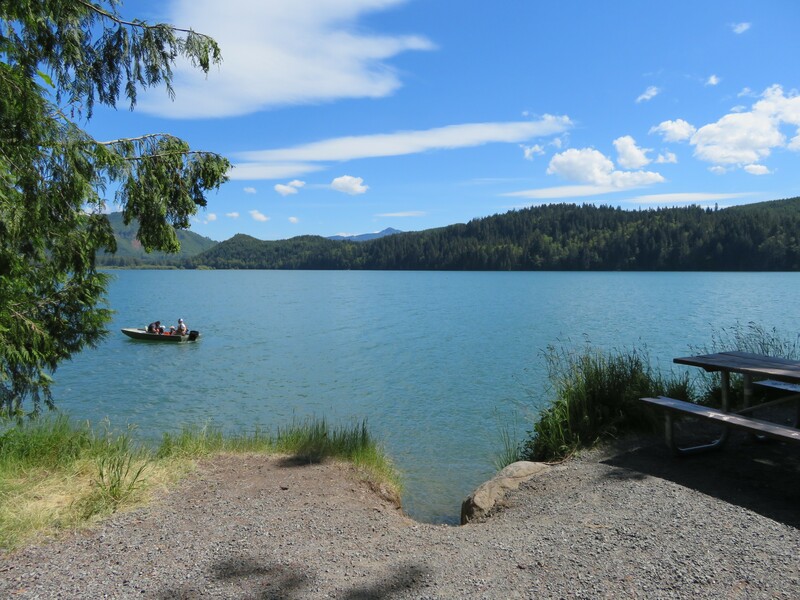 We drove by Alder Lake on our way to Mount Rainier and said that we would come back just to enjoy the view. We parked right by the park and found some benches where we could finally nibble on some of the cherries. The cherries were sweet and juicy. Delicious! After a few bite, my best friend and I dipped our feet in the water. It was a tad cold, tons of rocks in the water but that didn’t bother us too much. We enjoyed the view for a few minutes before heading back to Seattle. 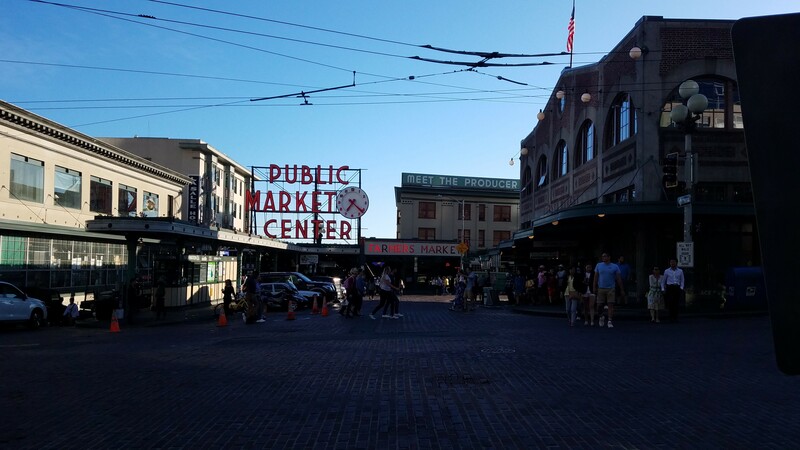 It was my best friend’s birthday, my other’s friends (SE) first time in Seattle so I decided to give them the grand tour. We took the bus from my brother’s place to Pike Market Place. 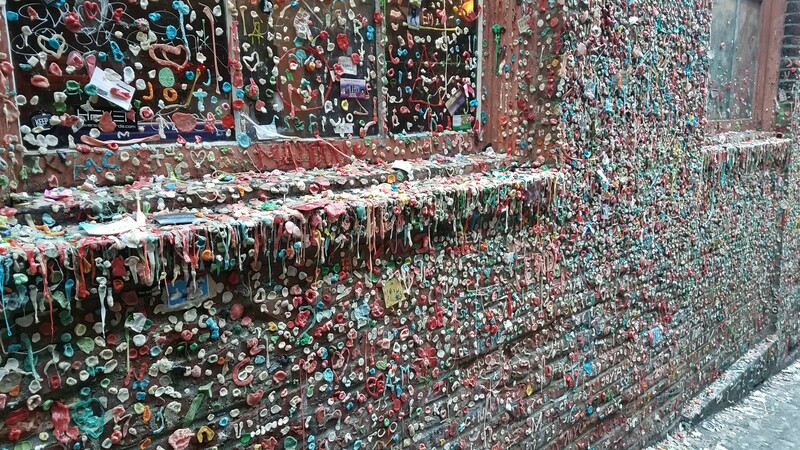 We bought a pack of gum and headed to the gum wall. SE placed his first gum on the wall. 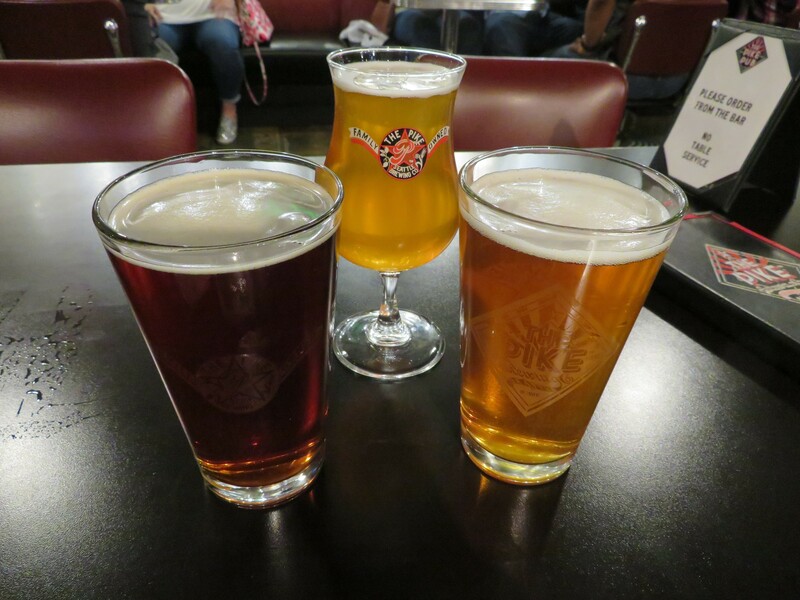 From there, we went to Pike Brewing Company. I love Pike Brewing Company. They have great beer selection, the lounge is full of “the history of beer” decor, and the facility is huge. We sat in the lounge. It was a self-service section of the restaurant (meaning we have to go to the bar to order). We ordered 3 beers and a pretzels for appetizers. From there, we were on a mission to find my BFF some clam chowder. Both SE and I are allergic to seafood so we are just in it to treat my BFF. It was past 8:30pm at this point so all the popular clam chowder spots were closed for the night. We decided to hit up Elliot’s Oyster House for their clam chowder. Elliot’s Oyster House is obviously known for their oysters but they also have 2 different types of clam chowders, white and red sauce. The white sauce is the traditional clam chowder and the red sauce is tomato base. My BFF ordered 3 oysters, and the traditional clam chowder while SE and myself ordered drinks. My BFF enjoyed her meal but claims that Monterey still has the best clam chowder. 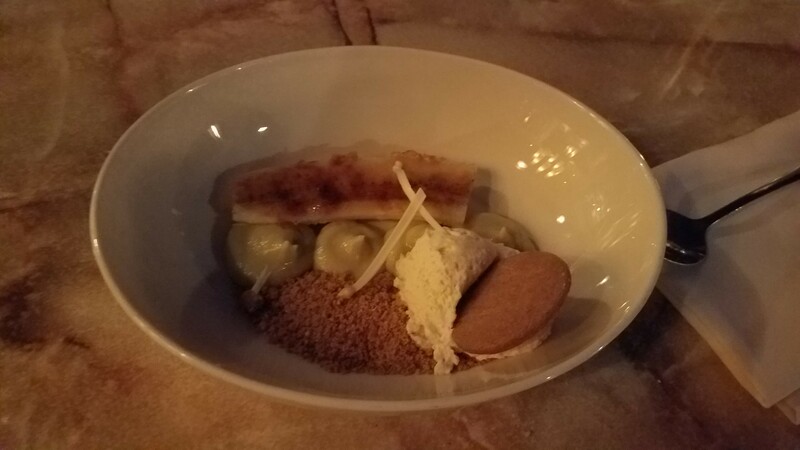 After dinner, I ordered the banana bread pudding. It was just mediocre. Our last stop of the night was Blarney Stone Pub and Restaurant located right across from Pike Market Place. We ordered a drink and played a few rounds of shuffleboard there before heading back on the bus. This day had a bunch of hiccups but I’m glad that I had great company. Sometimes it’s not all about what you do but who you are doing it with. 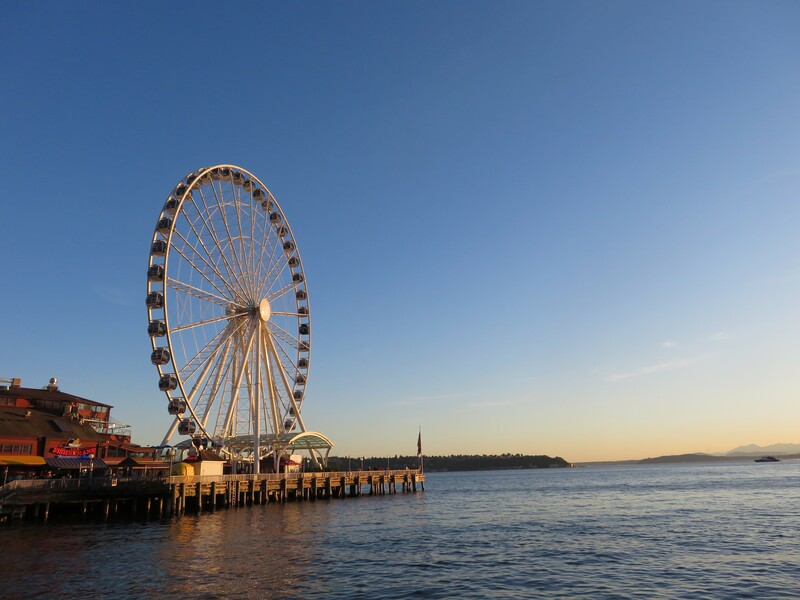 Can’t wait to return to Seattle. Thanks for the hospitality!